Your smile is one of the first things people notice about you. Unfortunately, our teeth rarely stay as white as we’d like them to be due to tea and coffee, red wine and a lot of the foods we enjoy eating! For some people, the teeth are just naturally yellower. 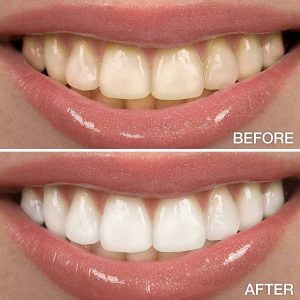 When done with proper professional supervision, teeth whitening is a cost-effective and safe way of giving you a sparkling, white smile. Over-the-counter DIY products are much less effective and can cause permanent damage to your teeth and gums. It is also important that your teeth and gums are assessed by a dentist pre-whitening to ensure it is suitable for you. At Westside Dentistry, we offer a take-home teeth whitening option. Although the process takes longer than an in-office tooth whitening treatment, the procedure is simple, very effective and less expensive. The first step for any patient considering teeth whitening, is to have a dental check-up. This is to ensure that there are no dental problems as, (for example), if a filling is needed, this should be done before using the whitening system, in order to avoid any possible discomfort from the bleaching gel getting into the cavity. After the check-up and any necessary dental work, a scale and clean leaves the teeth ready for whitening. Impressions of the teeth are taken and from these, the custom fitted bleaching trays are made. As Westside is a leading supplier of dentures Brisbane, their on-site laboratory is equipped to make the trays quickly. Patients can normally return to pick up their custom fitted teeth whitening kit in only a couple of days. We take impressions (moulds) of your teeth and make custom-fitted trays (which look like very thin mouthguards) that perfectly fit your teeth. The trays are then filled with whitening gel and placed over your teeth. The trays are usually left in for about an hour every night for 1-2 weeks. Our dentist, Dr Jay, will be with you every step of the way, from teaching you how to fill your trays to caring for them so they last for years to come! These custom fitted kits are hugely popular at the Westside practice and can give you a brighter, whiter smile! If you would like to find out more about the teeth whitening treatment options and alternatives available to you, please call to arrange an appointment on 07 3278 0580 today.